Fucoxanthin is a natural substance sourced from brown seaweed such as wakame (Undaria pinnatifida) and hijiki (Hijikia fusiformis). Said to offer a variety of health benefits, fucoxanthin is a carotenoid (a class of plant pigments with antioxidant effects). When it is ingested and enters the gastrointestinal tract, fucoxanthin is metabolized by digestive enzymes to fucoxanthinol and then absorbed in the intestines. In the liver, fucoxanthinol is coverted to amarouciaxanthin A.
Fucoxanthin is also available in dietary supplement form. Although it is found naturally in edible brown seaweed, there's some evidence that fucoxanthin from food sources in poorly absorbed. For instance, a small study found that one week of wakame intake (providing 6.1 mg of fucoxanthin per day) did little to raise the body's levels of fucoxanthinol. Some research suggests that consuming fucoxanthin with dietary fat (such as an fish oil and medium-chain triglycerides) could enhance the absorption of fucoxanthin. Proponents suggest that fucoxanthin can support weight loss by speeding up your metabolism and stimulating your body's ability to burn fat. Fucoxanthin is also touted as a natural remedy for the following health issues: diabetes, heart disease, high blood pressure, high cholesterol, metabolic syndrome, and obesity. Some preliminary research suggests that fucoxanthin may have a number of health-enhancing effects. For example, there's some evidence that fucoxanthin may reduce inflammation, as well as promote healthy functioning of the liver, blood vessels, brain, bones, skin, and eyes. Fucoxanthin also appears to stimulate the production of docosahexaenoic acid (DHA). A type of omega-3 fatty acid, DHA has been found to protect against a range of health problems, including arthritis, atherosclerosis, and depression. Fucoxanthin shows promise in the treatment and prevention of obesity, according to a research review published in Nutrition, Metabolism, and Cardiovascular Diseases in 2015. In their analysis of previously published experimental studies, the review's authors found that fucoxanthin may fight obesity in a number of ways. For example, the reviewed studies determined that fucoxanthin may inhibit the buildup of abdominal fat and reduce buildup of fat in the liver. There's also some evidence that fucoxanthin may affect the body's levels of leptin (a hormone essential for hunger control). An animal study published in Molecular Medicine Reports in 2009 found that fucoxanthin may aid in the management of diabetes. In the study, tests on mice demonstrated that fucoxanthin may help regulate blood sugar as well as treat insulin resistance. In preliminary studies on cell lines, scientists have observed that fucoxanthin may possess anti-cancer properties. These studies include a report published in Anticancer Research in 2015, which found that treatment with fucoxanthin may help thwart the proliferation of some breast cancer cells. It appears that fucoxanthin may suppress cancer growth in part by inducing apoptosis (a type of programmed cell death essential for stopping the proliferation of cancer cells), as well as by acting as an anti-angiogenesic agent (a type of substance that stalls the growth of new blood vessels). Since there's currently a lack of studies testing fucoxanthin's effects in humans, little is known about the safety of long-term or regular use of fucoxanthin products and how it might interact with medications. One study reported increased total cholesterol levels in mice fed fucoxanthin. Consuming large or regular amounts of seaweed may elevate your iodine levels. Excess iodine intake may result in iodine poisoning and interfere with the function of your thyroid gland. 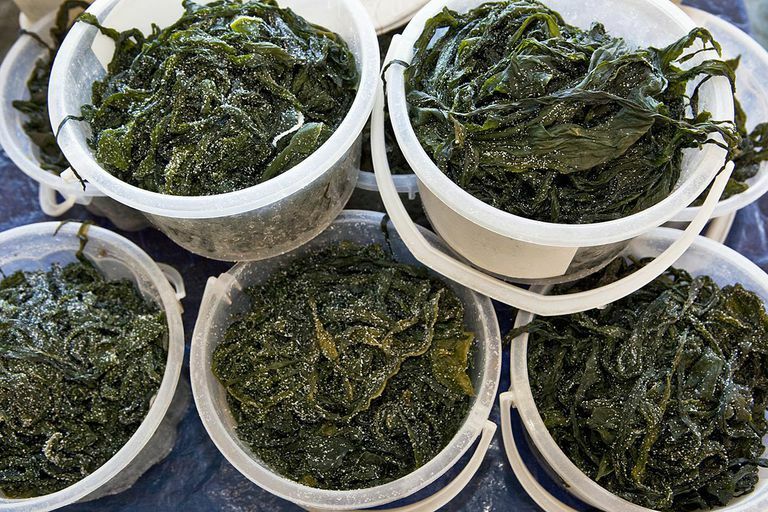 Seaweed may contain heavy metals (such as arsenic, cadmium, and lead) and other contaminants. Pregnant and breastfeeding women shouldn't take fucoxanthin. Due to a lack of scientific support for fucoxanthin's supposed health benefits, it's too soon to recommend the use of fucoxanthin supplements for any health-related purpose. If you're considering the use of fucoxanthin supplements, talk to your doctor before starting your supplement regimen. Maeda H, Hosokawa M, Sashima T, Murakami-Funayama K, Miyashita K. Anti-obesity and anti-diabetic effects of fucoxanthin on diet-induced obesity conditions in a murine model. Mol Med Rep. 2009 Nov-Dec;2(6):897-902. Martin LJ. "Fucoxanthin and Its Metabolite Fucoxanthinol in Cancer Prevention and Treatment." Mar Drugs. 2015 Jul 31;13(8):4784-98. Muradian Kh, Vaiserman A, Min KJ, Fraifeld VE. Fucoxanthin and lipid metabolism: A minireview. Nutr Metab Cardiovasc Dis. 2015;25(10):891-7. Rwigemera A, Mamelona J1, Martin LJ2. "Comparative effects between fucoxanthinol and its precursor fucoxanthin on viability and apoptosis of breast cancer cell lines MCF-7 and MDA-MB-231." Anticancer Res. 2015 Jan;35(1):207-19.